I can't find a solution for the bug in Phatch 0.2.7 installation after upgrade my OS to Mint 18. 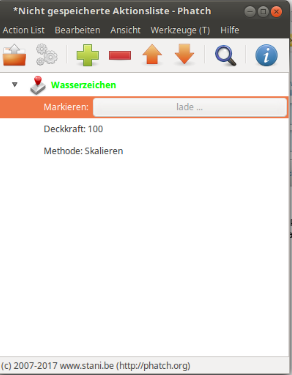 The problem is, that i try to open the drop down menu in Watermark Module and it isn't possible. Only it says LODING. I can't choose another image for watermarking. Attached the screenshot of phatch by try to open drop down menu of watermark images.